Below you will learn each of the available settings to create highly customized lead nurture and follow-up drip campaigns. Drip Campaign Name: Enter a custom, descriptive name for your new drip campaign. You may create multiple drip campaigns. Send Drips: Select days of the week you would like to send drips. Options are 7 days a week, Mon - Sat or Mon - Fri only. After Hours: This is alternate first drip message that is sent if lead was received after hours between 9pm and 8am. You can personalize this message to reference receiving the lead after hours. Total: This indicates the total length of time of all of all your drip campaign steps. Delay: Increment of time to start drip campaign from initial receipt of lead or if overnight, after 8am. Time: Unit of time delay between drips. You have 10 different options to schedule intervals between drip text messages and voicemail drops. Sched. : This allows you to pick a specific time to send a message. Use this to personalize your voicemail drops by referencing time of your call. 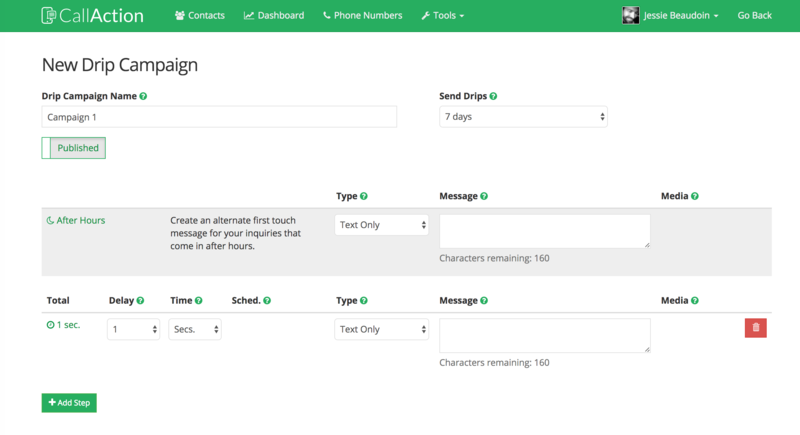 Type: Select one of 7 different types of messages to be sent in your drip campaign. Message: This is text message body which can also include emojis 🤓 for maximum personalization. Text messages longer than 160 characters will count as 2 individual touch messages as per mobile carrier. The combination of these settings allows you to create hundreds of different types of personalized marketing automation follow-up campaigns & lead nurture campaigns that create the highest lead engagement and conversion rates possible. Build your first custom drip campaign now. Not Currently Using CallAction to Capture, Track and Respond to Leads? CallAction is an intelligent marketing automation platform engineered to help increase lead conversions and engagement. The system captures, engages and tracks leads from the three primary forms of communication, calls, emails and text messages. We offer a free 14-day trial and personal one on one demo.